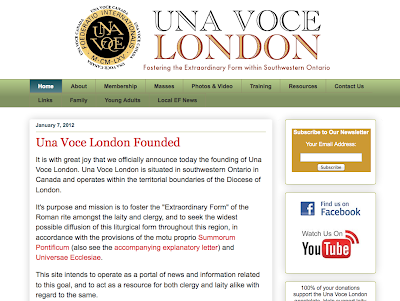 For those in the southern Ontario, Canada region, an Una Voce London chapter has been newly formed to promote the advancement and wider use of the usus antiquior in that region. The newly begun Una Voce London chapter is looking for local members who are interested in its objectives. It is also looking to be of assistance to clergy and seminarians in the area who are interested in the EF, and it seeks to help families, young adults and laity in general to live a liturgical life in accordance with the riches of our Roman liturgical patrimony.